Objective: Examine the effect of calpain inhibition(CI) on cardiac blood flow and vascular density in a swine model of chronic myocardial ischemia in the setting of metabolic syndrome (MS). Interventions: Pigs were fed a high fat diet for 4 weeks, then underwent placement of an ameroid constrictor to their left circumflex artery. Three weeks later animals received either: no drug, high cholesterol control (HCC; n= 8); low dose CI (0.12 mg/kg; LCI, n = 9); or high dose CI (0.25 mg/kg; HCI, n= 8). The diets and CI were continued for 5 weeks, followed by euthanasia and myocardial tissue harvest. Results: Pigs in the LCI and HCI groups had increased capillary and arterial counts in the ischemic and increased capillary counts in the non-ischemic myocardium compared to the HCC group. 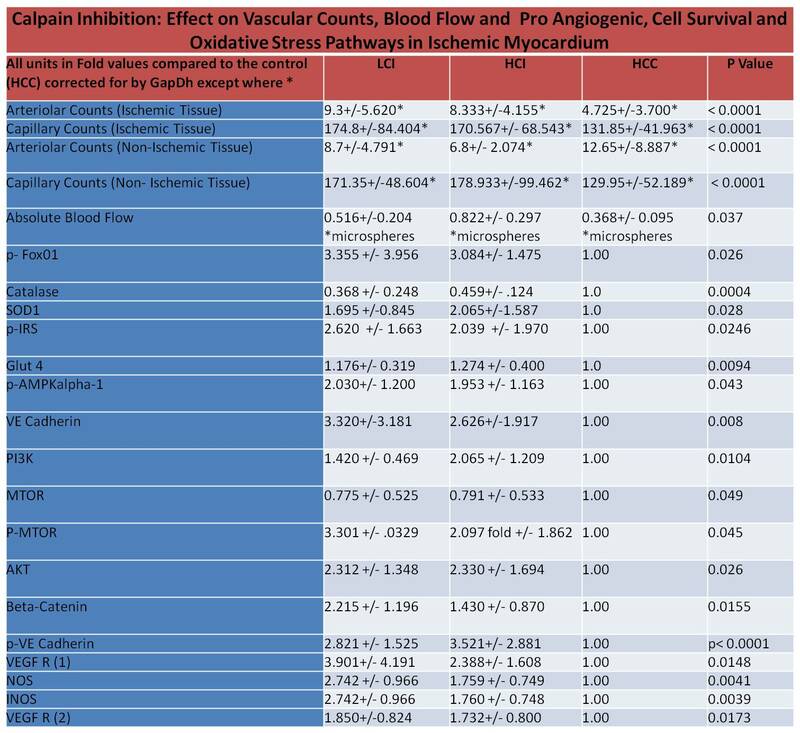 Absolute blood flow in ischemic tissue was significantly increased in the LCI and HCI groups compared to the HCC group There was significant up-regulation of proteins involved in pro-angiogenesis, cellular survival and decreased oxidative stress in the LCI and HCI groups compared to the HCC group. Conclusions: In setting of MS and chronic myocardial ischemia, CI increased myocardial perfusion and arteriolar and capillary counts. We identified several molecular pathways through which CI works to mediate these effects. Future work will further investigate these pathways. These findings have clinical implications by improving myocardial angiogenesis and perfusion in patients that have no options for coronary revascularization.